Father and daughter strike a pose for the Boots on the Bruce fundraiser, here at the junction of the Dundurn Stairs and the Bruce Trail in Hamilton Ontario. The funding run by Keen Canada ends with October, so if you've been holding off, now's the time! 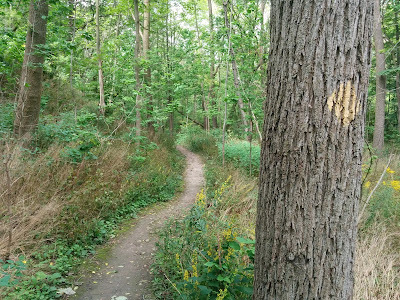 Take photos of your boots on the Bruce Trail and send them in. For each pair, Keen is donating $5.00 to the Bruce Trail Conservancy. The one I am sending them is from the same walk, but with a couple of women who were "doing" the stairs as exercise - they gamely joined us to lend their arch support for the cause. Thank you ladies! Thank you Keen Canada, thank you Bruce Trail!